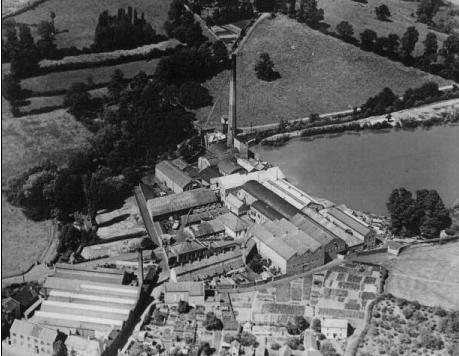 Around 1761 William Champion, the owner of Warmley brass works, wanted to expand his business and chose the battery mills (known as Bitton Mill) on the River Boyd at Bitton. In order to expand spelter, copper and brass production and find the necessary investment he partnered with Charles Whittuck of Hanham Hall, who owned coal mines in the area, Charles Bragge (later Lord Bathurst) of Cleve Hill, another coal owner, and Norborne Berkeley (later Lord Botetourt) of Stoke Park, M.P. for Gloucestershire and Thomas Goldney. 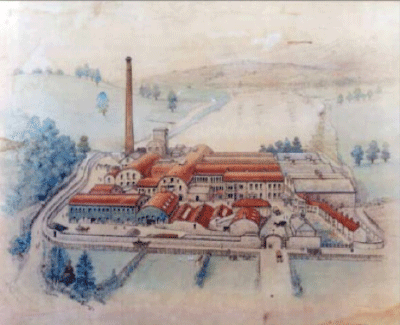 The site was purchased by Thomas Bevan in the early 1830s and converted to a paper mill, but after a major fire in 1849 Mr Bevan sold the premises to Mr Sommerville who invited two fellow scots, the Torrance brothers, who were millwrights, to repair and maintain the mill machines. Another fire occurred in 1875 (reported in Western Daily Press) but the mill was rebuilt and enlarged. The late 1890s manufacturing paper making process used perhaps surprising components. Rags, Spanish esparto grass from various areas including Tunis, and for better quality paper wood pulp from Norway. Coal for the boiler room was consumed at 200-300 tons per week to supply the steam power for the machines. The rag -cutting room was the start of the process. Girls with scythe like knives shredded the rags, which were then graded by the sorters. The duster machine, known as the “Devil”, threw the rags around to remove dust. Separated linen or cotton was then mixed with soda ash and caustic in one of three boilers each holding a ton of rags. After twelve hours in the revolving boilers the rags were rinsed and put into an iron trough called a washing engine or breaker, which shreds and converts to pulp. The pulp was washed in the breaker for about two hours then emptied into another container and mixed with chloride of lime to bleach, then emptied into vats after being sieved ready for the paper making room. A mould in the paper making room was able to transform the pulp , with the help of a contraption called a “deckle strap” into paper to the customers requirements. The mould consisted of a web of wire cloth and revolving rollers, which travelling at 70ft per minute mixed and drained the pulp of water until it became absorbent paper and the water mark was impressed. Once dried the paper was passed to the cutting room and then onto the stage called the “Salle” where workers called “runners down” checked and graded each sheet into first grade, second grade or discarded, which was re-pulped. The paper was then glazed, folded and packed for the merchant. The complete checking process included testing composition, weight, bulk, folding, bursting, tearing and fastness to light before packing into bundles for home use and wooden crates for export. This process continued from six Monday morning until six Saturday evening employing around 450 men, women and children. Around 1900 William Sommerville transferred the mill to the King-Smith family, Mr Charles King-Smith JP (formerly of Reed & Smith of Devon) Capt. R King-Smith DSO MC and Philip King-Smith. 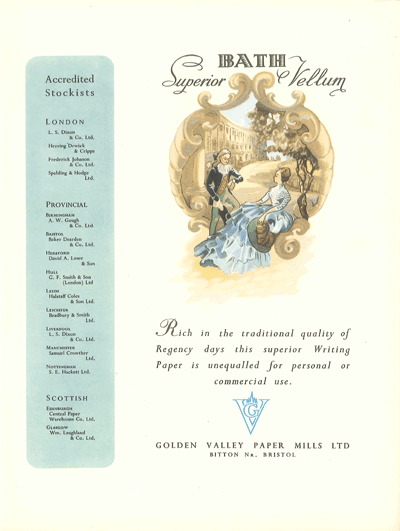 Then thirty years later the business became a limited company called The Golden Valley Paper Mill which produced electricity for the village until the early thirties and paper until the 1960s. Queen Mary, the Duke of Beaufort and his wife visited the mill during WWII and toured the site meeting members of the work force. From the first census in 1841 evidence shows the growing importance of both the local work force and the mill through- out the 19th and well into the 20th century. 1851 records an age range of workers: Alice Wynne 50,rag cutter, Elizabeth Hicks 46, paper finisher, Harriett Cooper 13 and Ann Bush 16, rag cutters, Peter Fudge 19, paper maker. In 1861 sisters Ellen 17, Sarah 13 and Ann Jones 19, were all paper cutters; Anne Hopes 23 rag cutter, brothers John 11 and William Hicks 13, paper mill boys; Albert Cook 11, paper sorter. In 1871, Thomas Workman, fireman, Edward Luker, paper sizer, George Short and George Spare engineers, Sarah Ann Hicks 16, paper sorter and Martha Adams paper maker. In the 1881 census, Andrew and Edwin Short, George and Eva Hacker, Phoebe Prouse and James Jefferies. In 1891 Edmund Haskins 44, Fredrick Coles 14, Lilly Mathews 32, Lillian Hambling and Samuel Harwood all recorded in various paper mill occupations. The later 1901 census includes Herbert Summerill 25 engine driver at mill, Henry Gallop 43 clerk, George Gerrish 26 carter in mill, Ella Davey 17 and Florence Blackman rag sorters. 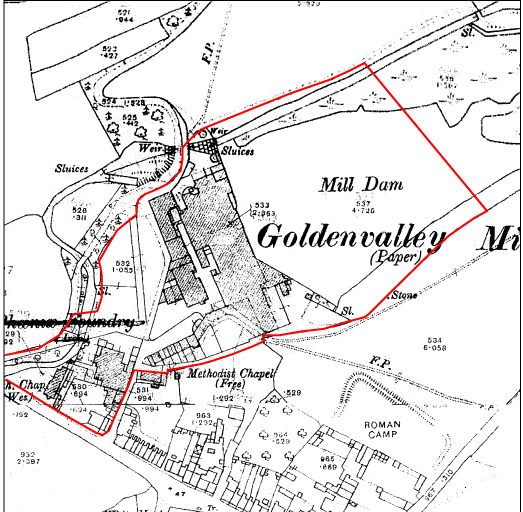 During the life time of the mill, the paper maker employed many of the parish residents but some of the other occupations for men were coal mining, hat making, farming and foundry work and for women stay making, pin making, domestic and service. Although some of the old buildings are still on site they have fallen into disrepair but hopefully future development will establish the future and embrace the past. From 1962 to 2006 the works were used for the production of automotive parts. In 1962 Prestfibre a company from Reading were looking to expand their operation of moulding the bucket seats for the Morris and Austin 1100 from wood-fibre. New products were introduced – a gear box cover for the Triumph Herald, wheel arch covers for the Hillman Imp, heater nozzles for the Ford Zephyr, baby seats for Britax, door pockets for Jaguar and suitcase shells for Antler. The company survived the disastrous flood of 1968 and made plans in the 1970s to update the facility, including filling-in part of the pond at the rear of the mill. The work was completed in 1980 at the time a contract was won to build the facia for the Vauxhall Astra. The new work load necessitated extending the production line and a new pond was built at the northern end of the site. In the 1980s Marley Automotive Controls took over the operation and at that time door panels for the Ford Ecort were made. The company decided to start producing with plastic, but this was a failure. Magna (Intier) took over the company in 1996, but at tis time the automotive industry was demanding a new logistical approach that dictated the use of suppliers that were close to the car production lines. Manufacture at Bitton ceased in 2006.